In our busy lives, it is easy to be seduced by the idea of all the self-love marketing tactics. We see ads for mascara telling us parents that we are “worth it” and we use our precious ‘me time’ for an express mani-pedi while mentally running through our to-do list. Of course, adornment and maintenance can all be a part of taking care of our bodies but it is certainly not the be all and end all when it comes to self-care. The best type of self-care is when looking after our body, mind and spirit align and we walk away feeling fulfilled, refreshed and with a more relaxed attitude towards life! It goes without saying that here at Sounds Like This, our favourite self-love activity requires no additional props or resources. Everything you already have is everything you need. Here’s our 3 favourite ways that singing can help you feel on top of the world. Think you have to hit the gym to get exercise? Not so! Singing is actually a wonderful way to breathe in loads of additional oxygen which can increase aerobic capacity. Plus, your lungs and diaphragm get a good work out too as your project your voice. Furthermore, your posture can improve as you naturally move your body to create more space for your lungs and core. Still not convinced that singing can improve your physical health? Well if you live with someone who experiences low quality sleep it might be time to engage them in a duet before bed. Singing can strengthen the palate and throat muscles which can decrease sleep disruptors like snoring and sleep apnea. What’s not to love? Singing makes you feel good. It may seem obvious but have you ever thought of just why you feel amazing after singing along to your favourite song? It’s because singing is known to release endorphins-that happy brain chemical we could all do with a bit more of! And before you start thinking that your quality of the singing is not good enough to make those around you happy, think again. Pleasure, regardless of what the singing sounds like, is the result of the singing frequencies impacting our sacculus. This tiny ear organ responds immediately to any kind of singing with zero judgement of pitch, tone, volume or harmony! Singing can also lower the amount of cortisol in your bloodstream while releasing overall muscle tension. That’s why singing in the car can make a long commute that much more enjoyable. When you come to a class with Sounds Like This or any group music session, you have the opportunity to meet new people, form connections and improve your social life. As you sing in front of other people your confidence builds, you bond through a shared experience and all those feel-good chemicals signal to your mind and body that this type of experience is one to be repeated. Immersing yourself and your children in different styles of music can also open up brand new experiences. Perhaps you discover you love jazz and decide to spend next Saturday night at a cool little jazz club in the city. You may join a choir, start going to live gigs again or even dig out those old CDs and reminisce with your partner about those good old, pre-kid days! Just sing. It’s as simple as that. Take a deep breath, open your mouth and let that music out. Your body, mind and soul with thank you for it. If you’d like to find out all about the benefits of singing firsthand, why not join us with your little one at one of our group classes? Bookings via the booking page. It has taken you hours to get organised and here – and now your child won’t get down off your lap and participate! Parents invest time and money enrolling their toddlers and pre-schoolers in organised, educational groups and classes. Playgroups, music groups, sensory play, story-time – millennial children have opportunities to fill every day and more. But what can you do if your little one resists engagement and prefers to watch? Well, firstly, it’s okay by the facilitator and other adults! Relax – it’s not just you or your child. It is very typical for small children to stay close to their caregiver in any new situation and especially so during the multiple periods of separation anxiety of the first couple of years. Early childhood educators are trained to expect this and should not want you to push your toddler or older child to participate. As for other parents or grandparents, they have likely been in the same situation here or in another activity and they are on your side! Commonly, it takes a few sessions for children to feel at home in a new space, with new people, new sights and sounds. Anxiety is a normal response and staying close to a trusted adult is a typical response. Allow your child time to become familiar with the space and reassure them verbally and physically. Arrive early if you can. Walking into an activity which has already started is stressful for anyone. By arriving early, your child has time to meet the facilitator or teacher, see the space before many adults and children arrive and experience the space before additional sounds and other stimuli are added. Guided by the leader, find a spot where you can observe others arriving and talk to your child about what they are seeing: “Here comes a child with a blue shirt like yours”. “That child is sitting on a cushion like we are”. “That person has a baby like your sister”. Gentle observations, with no expectation of response from your child. If they point to something or make a comment, reflect that observation back to them: “Yes – that child has a teddy too”. If they comment on sights or sounds in the space, acknowledge these too: “Yes, the music is playing. It is louder”. “The children are running around. We are sitting down.”. Allow time to just observe. Participate yourself. Gently sing the welcome song while your child sits on your lap. Take part in an activity holding your child on your hip or secure in a baby carrier. Talk to your child about what you are doing, what the teacher is doing, what other families are doing. Allow your child the space to begin participating in any way they wish. This might be gently bouncing on your lap instead of skipping around in the circle. It might be quietly making the animal sounds while everyone else acts them out more vigorously. Watch for subtle signs your child is engaged: a tapping foot when the music plays. Rhythmic movement when others beat the drum. Looking in the direction the teacher has indicated the children move to. Observation IS participation, just in a very subtle form. Encourage engagement with small parts of the session that seem less overwhelming. If everyone is digging for bugs, sit with your child away from the main group and do a little digging yourselves. Watch the parachute go up and down while other children run under it and encourage your child to help you hold the edge. If everyone is painting rainbows, offer a pre-loaded paintbrush with just one colour and focus on that. Remember: process not product is most important. There will be plenty of make and take activities to put on the fridge one day – for now, focus on gentle experiences. Follow up at home! This is my favourite way to engage reluctant children. Reproduce some of the activities in the security of home. Sing the songs from class: ask the teacher or Google for the lyrics. Improvise instruments that replicate those used or invest in a couple of inexpensive items like egg shakers or bells. Find some scarves in your wardrobe or op shop. Go digging for bugs in your own garden. Borrow books from the library that have been featured in story-time. Get out some blocks. Water your own garden. Do some simple messy play – outside makes it less stressful for you! Use the sessions you attend as inspiration for play at home. Rather than thinking your child should be learning, consider the classes as lessons for you in playing with your child! If you find your child is still resisting participation a few weeks into term, then consider other factors: is it too close to nap time for your child? Are they hungry? Is the space to big or too small for them to feel comfortable? Would an indoor activity - or an outdoor one! - suit them better? Are they more interested in building cubbies with sticks than towers with blocks? Dancing than singing? Art more than gymnastics? Sometimes it is the case of the right activity at the wrong time or the wrong activity at the right time! So, ask about different session times or explore alternative activities. Smaller groups. Quieter spaces. Different sensory stimulus. Take a break for a term and try again. If your toddler is experiencing high separation anxiety right now; getting two-year-old molars; recovering from illness; a new house or sibling or other big changes – it might be case of leave it for now and start over next term. Ask around if friends or family might take over your place in class or ask the teacher if there are families on a waiting list who might love your space! It’s okay to revise and revisit activities: remember the activity is for the child. If it isn’t working, then they are not enjoying it or learning. At the end of the day, formal activities are additional to unstructured play at home. Classes and groups are as much about social connection for parents as they are learning opportunities for toddlers. They should be things you want to do, not something you feel you must do. Choose activities you feel comfortable engaging in – your child will pick up on your responses and if you are having fun, then they will start to as well. And before you know it, you will both be eager to get to class and take part in all the fun! Kids and dogs. When it comes to picking up the vibe in a room, always look to children or animals to see what their reactions are. Kids have a sixth sense for seeing through adults who are trying to win them over, trying to persuade them to behave a certain way or just trying too hard in general! That is why, when it comes to interacting with children, authenticity wins each and every time. The good news is, as complex human beings, we have a range of emotions we can access at any given moment to foster a sense of mystery, calm or wonder, depending on what the situation calls for. Some of the best advice I received during my music training was to find my inner silliness and let her out to play. I discovered that when it comes to working with children, being silly is a superpower! That’s why all my lessons are underpinned with a sense of fun and playfulness that captures the attention and sparks the curiosity of my students. How do I do this in a genuinely authentic way? Well, last week, I wore a tutu to class. That’s right, a beautiful, ethereal, soft mint tutu. Full disclosure: I actually have one in red too. I felt inspired by the children who come to our group sessions proudly sporting a fairy dress or princess crown. They spin and curtsy and hop from foot to foot as they dance around the room absolutely immersed in the experience. I looked inside myself and found that YES! I wanted to express myself in joyful and magical ways with my choice of attire too. And how lucky I am that my workplace is filled with gorgeous, tiny humans who celebrated this new outfit of choice with me. I also make silly noises. It doesn’t feel awkward to make bopping sounds as I collect shaker eggs on my palms in front of a room full of people, it feels silly and fun! And feeling silly and funny engages those little ears and eyes as the pleasure of the unexpected captivates them. Being silly myself gives parents and children permission to be silly right along with me. And couldn’t we all do with a little more fun and silliness in our lives? I move my body is silly ways. Be it the foot tapping, hip swaying actions accompanying My Aunt Came Back or simply using my hands to create a pair of glasses, our bodies are just made for movement. Loosening up, relaxing and really getting in to the musical experience role models to the children that music making is something to be enjoyed. It’s not all serious scales, it is fun and laughter and enjoyment. That is what music is all about! My face. Have you ever made a toddler giggle just by pursing your lips and raising your eye brows? If you haven’t, you are missing out! We have around 40 muscles in our face which makes for some very silly combinations. Minutes after they are born, babies usually start scanning faces. They find them absolutely fascinating. Having a baby or toddler’s attention held by making funny faces fosters their social, emotional and visual development. Once you have their attention, they are much more likely to pay attention to what is being said (or how it is being sung) too. However you choose to let out your inner silly, know that classes with Sounds Like This are always a safe space for adults and children to explore and play with their silly sides. Funny face, silly noises and tutus are always welcome! It’s 10am on a Monday and you’re hitting music group with your toddler. You meet in a hall with around 20 other mums, dads, grandparents and nannies and just as many kids straining on their carer’s arms to get the party started. Someone gives you a cup of tea as you sit on a plastic chair on the sidelines and your child runs off to join the other kids. There are floorboards so the acoustics are a bit off. You begin to feel like you have to raise your voice to be heard over the thumping echoes of children running around as you chat to the mums beside you. You start wondering why the children are, in fact, running around chasing each other in circles. Someone falls over a stray sippy-cup and starts wailing. Does anyone have a band-aid? You side-eye a toddler wrestling another to the ground as the noise, energy and lack of parental involvement crescendo before your very eyes. Isn’t this supposed to be a music group? You pay your $2 and the moment all the children have been waiting for arrives. The group leader places a plastic tub of instruments on the floor and someone hits play on a children’s music CD. The children fall upon the bucket vying for the coveted single mini-recorder that squeaks as shrilly as a whistle and is very effective at irritating parents. Then, the toddler dance party begins. They jump up and down to The Wiggles for a few minutes, waving scarves and shaking bright yellow plastic maracas. There’s screaming, so much screaming. The children sing along to words they don’t yet understand and copy the actions of the leader as they rock-a-bye their bears. They stand, transfixed, copying, imitating, attempting to keep up with a routine that is just slightly too fast for them. The dad next to you begins telling you about little Johnny’s toilet training exploits. You want to listen, you really do, you love chatting with other parents-it’s just that you’ve only now noticed that your little one is losing interest in the dance party and has begun to use the maraca against the wall to see what that sounds like instead. You excuse yourself and quickly make your way over to him to tell him off- ‘We don’t hammer walls with maracas”-and try to convince him to join in again just as a Justine Clarke song suggests spitting out watermelon pips. Your child obliges and makes spitting attempts in your direction. You wonder why he is being so wild when you notice all the other kids are following suit and falling about laughing as their spittle flies in each other’s faces. The music ends. The teacups are empty. The children and overstimulated and tired. You are frazzled. You paid for this? Same time next week? Everyone loves a toddler dance party-they can be a fun part of a Friday night for parents home with their kids- but this doth not a music class make! Are the kids being entertained? Yes-ish. Are they having value added to their musical development? No. Will you feel empowered and encouraged to replicate this kind of music experience at home? Definitely not! At Sounds Like This we create a calm and cosy environment for children to build a strong foundation in music skills. We use real instruments in real time to foster an understanding of pitch, tone and beat. Our philosophy is that by giving parents the confidence to share music with their child, we can pass on a lifelong gift to the next generation. Ready to experience a real music class with teachers trained in music? Come and check us out. This may seem obvious but when seeking out a music class or tutoring, you’ll want to be sure that the teacher is willing and able to tune in to your child’s needs. Look for teachers who invest in their own professional development and craft. Teachers, that not only have the education, skills and experience you are looking for but the enthusiasm and genuine love for teaching that is impossible to fake. Here at Sounds Like This, we offer trial sessions so you can be sure that our playful, relaxed, brain growing sessions are a good match for you and your child. Tired toddlers or rushed parents may not be in the best state of mind to enjoy all the music making fun that music classes can offer. Choose a time that fits in with your routine and gives you a bit of a buffer at either side so you can be fully present. Sounds Like This offers a range of class times and days to deliver flexible options for busy families. Through our many years of experience delivering music classes (in addition to our own parenting journey) we have come to learn that when it comes to kids, flexibility can save the day! When researching music classes nearby, take a look at their expectations of the child. Although some structure can keep the class running smoothly, rigid rules can steal the joy for children and parents alike. Are you looking for a music class that will entertain your child for an hour a week? Or are you looking for a class that will foster development using music, teach you music skills to use at home and is underpinned by a firm knowledge of how music can impact a child’s brain? If it’s the latter, then Sounds Like This is the place for you! There’s a lot to be said for the way an environment or person can make us feel. If you feel confident and relaxed during a class then your child will reciprocate with their own relaxed attitude. At Sounds Like This, we emphasis play in all our classes. We play with sounds, with instruments and with each other! Listen to your instincts and you will most likely know if a class is suited to you and your child. If you’re after specific information about all of the classes we have on offer, please contact us. One of our favourite pentatonic songs from class. : Detta Detta. Do, Re, Mi, So and La. Leaving out the other notes. Pentatonic scales are used extensively in folk and classical music, but also form the basis for heaps of modern patterns that much of our pop, rock, funk, even metal songs are written in, and the pentatonic is just a side step away from the blues scale and a host of other rad tonal concepts that make up a rich tapestry of pitched musical patterns. In terms of musical development it is handy dandy to be able to hear. Detta Detta is a charming Japanese folk song. If you sing it slower it may be used as a lullaby. As soon as you hear it, you’ll notice that the patten is very similar to other songs you may have heard from across Asia. It is not just western culture that’s pentatonic obsessed. In Sounds Like This classes you’ll hear many pentatonic songs as well songs that when combined, make up the pentatonic patterns. Songs with just Do, Re, Mi and So, La, Mi. That means even if you’re not a comfortable or confident singer, we can step you through and support your listening, oral and aural development at the same time as the children. Head here for the video. We love celebrating all skills that the children bring to our music classes and believe that everyone has their own special talents. When it comes to academic skills, music can help children gain confidence. For starters, reciting songs relies on short-term memory and eventually long-term memory. Plucking a guitar string teaches children about vibrations and recognising the patterns of beat introduces simple mathematical concepts. This hands-on learning allows children to directly experience and observe what is happening during our music classes for kids. Self-esteem can impact several different elements of your child’s learning. Watching other children experiment with instruments, having the time and space to experiment themselves and enjoying the celebration and positivity we share during our session can all deliver a boost to your child’s self-esteem. Problem-solving is an organic by-product of music making and one that is very much enjoyed by the pre-schoolers in our sessions. Our small group sizes allow us to work closely with parents and children on individual objectives. If you have something on your wish-list for your child’s experience that focuses on their physical, cultural or social/emotional needs, let’s have a chat and come up with ways we can deliver this during our music classes. Research shows that participating in music can spark changes in the brain; clapping along, singing or experimenting with instruments are all included! Sound processing, distinguishing similar-sounding syllables and impacts on the nervous system all contribute to linguistic development as well as early literacy skills. The most important part of this research is that these benefits are represented strongly in children participating in music classes. And how do we encourage participation in our music classes for children? By removing any and all pressure and allowing the child to make their own choice about how they join in. Foot on the drum? Fine! Sprawled across dad’s lap instead of sitting upright in a circle? Terrific! A cheeky smile in response to a question? Excellent! Allowing kids to relax opens up plenty of space for learning and developing a love for music making. Your pre-schooler may have emerged from toddlerdom with a little more impulse control and greater receptive language skills but emotional regulation is still something that needs time and opportunity to grow. Emotional regulation can assist kids in facing change in their lives (such as a new sibling or starting school.) In addition to this, research also shows that dancing can help children learn how to share and cooperate as well as develop skills in working together. Using intentional music experiences to calm pre-schoolers down, such as a calming lullaby at the end of the session, can help children deal with stressful situations. Parents and carers can also develop their skills in delivering these experiences and use them at home as needed! Music classes can bring a profound benefit to so many children as it is an important form of communication and self-expression. Aside from our points listed above, the love of music that children can develop during our classes would have to be our favourite outcome of all. Click here to take a look at our music classes for kids. Let’s face it, there are some books that your kids love that you feel like hiding at the back of the shelf. Sometimes though, mixing it up by singing the story instead of reading it can be enough to get you through another rendition! Here’s our top 5 books that you can sing to your kids when you have read it so many times it’s at risk of getting “lost”. This one is a bit longer than your average picture book so if it is on high rotation, it may be time to keep things interesting by turning it into a song. The rhyming language means you can not go wrong-the words will keep the beat and you just choose your notes. Your child is almost guaranteed to love any way that you sing this! Because there are a few different characters in this one, you can even experiment with different characterisations to take your storytelling to the next level. You know this one already. It’s as easy as A-B-C! Experimenting with the tempo can take these books all the way to bedtime; when sung in a soothing, calming way the humble alphabet can be very relaxing. This one gets extra points as when you take turns singing the letters with your little one, you’re giving them a head start in recognising the order of the alphabet. This one is fun (seriously!) Once you learn how to sing this story you will find yourself using it in the backyard, at the park and even venturing up your hallway with your kids. It encourages exaggerated movements as you walk through tall “grass”, pick your way through “mud” and finally run back home to bed! Again, it uses repetitive language so maybe a simpler story for your kids to learn too, allowing them to join in with you. There are many versions of this as lots of clever people decided to take a classic nursery rhyme and turn it into a storybook. The advantage of this is that you probably already know the tune so you can fudge your way through any additional lyrics that the author may have added in there. Needless to say, this is the perfect choice for those rainy days when you are stuck indoors all day. This is just the tip of the iceberg when it comes to popular books you may already own. Take another look at that bookshelf and see what other songs are hiding in there! Motor skill development in toddlers can be a tricky area to navigate as their impulse control catches up to their physical coordination. Therefore, bumps and bruises seem to be an anticipated norm when it comes to gross motor development in toddlers. Research shows that limiting screen time may assist your toddler in developing across each area of development so if they are not sitting still, they’ll naturally be on the move. As with many areas of development, time and practice makes perfect! Using their hands to bang a drum uses their Biceps and Triceps as well as all that fabulous hand-eye coordination. This make a great first step. Graduating to shaking bells while marching to a beat gets those little legs moving and encourages core strength as they hold their bodies upright and move around. The more fun your child has using these big muscle groups, the more often they will want to engage in these strengthening activities. As the joy in play is reinforced, these types of experiences will become second nature. Introduce your toddler to dancing with scarves or ribbons and watch the way their movements change. Ask them to move like a butterfly, hop like a kangaroo or swim like a fish and see just how broad their range of movement can be. There’s also nothing wrong with a good old-fashioned disco dance-off either! Jumping to the beat offers the opportunity to stretch those legs out and anticipate landing safely. Moving on from finger-play songs can be an exciting time in toddler development-for both child and adult. They may be ready for big, body movements as they enjoy songs like Head, Shoulders, Knees and Toes or Row, Row, Row Your Boat. Sit with your child facing you as your sing these songs together to allow him or her to mimic your movements. Singing songs together about galloping through the fields or trotting down the lane while you bounce your toddler on your knee provides the chance for your child to identify what muscles they need to engage to keep their balance. Plus, these types of songs are really fun and your toddler is highly likely to absolutely love them. Added bonus: As your toddler grows, you’ll be strengthening your legs at the same time! So much more fun than squats, ha ha! 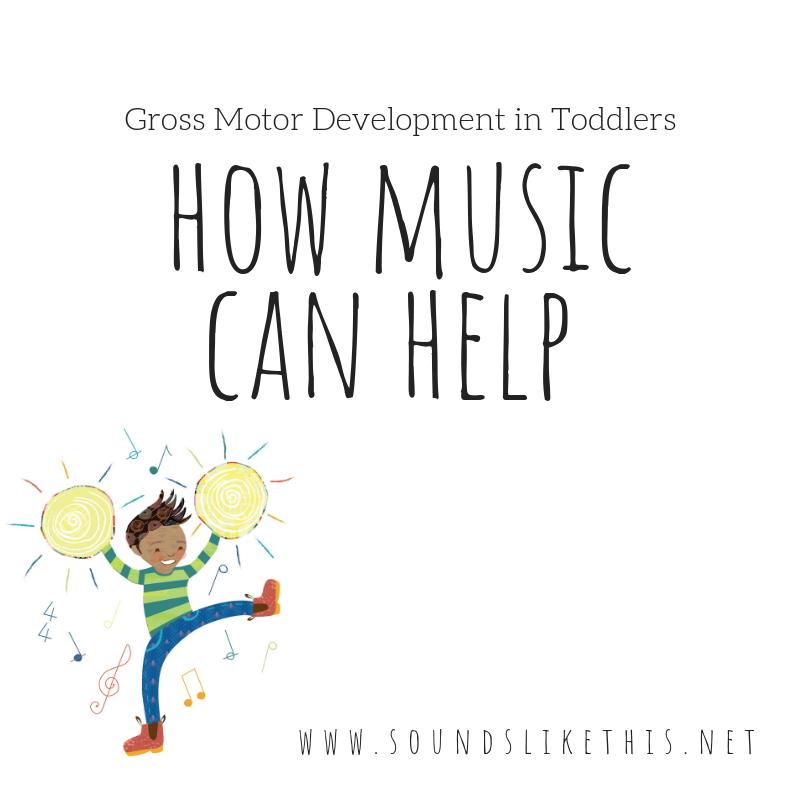 Music and movement can go hand in hand very naturally and is a great way to get your toddler moving without any pressure to perform a certain task in a certain way. The pleasure in music and movement is all in the process for your toddler and can be really enjoyable for both child and adult alike. How many other ways can you think of to get your child moving using music? While expressive speech may be a few months off, learning how to understand the rules of language is occurring from day dot. Turn-taking is an important element of communication and by using music, you can offer your baby the chance to begin to develop this skill. Sing songs that require copying or call and response to give your little one the idea that when you finish, he or she starts. Side note: Mastering the pause that is usually required to elicit a response can feel unnatural for an adult. Once you have sung your part, look at your baby expectantly and count to ten slowly in your head before you are tempted to fill in the silence for them. The idea is to let them know it is their turn without them wondering why you have finished the song and moved on! Studies show that when babies are given the opportunity to experiment with music making (not just passive listening) they will show a preference to in-key pieces of music earlier than babies who have not. In addition to this, babies who have had this experience also show larger and earlier brain responses to musical tones. One of the many, many things that a baby’s developing brain is organising is understanding how their world is structured. Their little brains are hardwired to sort sounds into categories. Was that someone speaking or just footsteps? Was that the neighbour’s dog or a washing machine? All these noises and sounds allow them to create a memory bank of their knowledge about the world. Being exposed to music exercises this ability to sort sound and provide another opportunity for pleasure. Listening, making and enjoying music together doesn’t have to be just another task on your to-do list. It can be a wonderful way to bond with your baby and spend some quality time in each other’s company. When your day is filled with feeding, washing, cooking, settling, why not take some time out to enjoy the simple pleasure of music together? Hush Little Baby. The repetition in this one is great for bedtime. It’s also perfect for tired mums and dads as if you forget the words, just sub in anything that rhymes! 1-2-3-4-5 Once I Caught A Fish Alive is wonderful for when your baby is learning to track with their eyes. As you count off your fingers, watch your little one be captivated by your movements. Before you start to cover your ears and never speak to us again, keep in mind that simply hitting a pot with a spoon can encourage your little toddler music maker to sporadically keep time. Grab your own pot and spoon and imitate what your toddler is doing-copy their rhythm and see how delighted they are to be running the show! Most toddlers love to join in on a song but sometimes the language is not quite there for them to sing along. This is where joining in by doing the actions encourages enjoyment and participation while their verbal skills develop. Sing songs such as Twinkle-Twinkle, Insy-Winsy or Open, Shut Them and role model the movements to your toddler as you sing. They’ll soon understand the link between the two and you may even find a few song requests coming your way by little fingers twinkling in your face! The Park on Schnapper Point Drive, Mornington. This park has some chimes set up. Do a treasure hunt beforehand to find the perfect stick to use or B.Y.O beater! Ballam Park, Frankston. Aside from being an amazing playground, this park features Talk Tubes. One person speaks into a mouth piece while another, some distance away, can hear the sound through at their end! Lots of fun to be had experimenting with sounds, songs and noises. Take a closer look at your local park and see what opportunities there are for toddler music activities. If you toddler is a natural dancer, enhance the experience by adding some bells in to the mix. There are many kids of bells that a toddler can enjoy however for dancing, wearing the bells on their ankles and wrists frees up their hands for all the movement they will want to be enjoying. While their body responded to the beat, the bells respond to their movement and a lovely feedback-synergy takes place. Perhaps the most important element is introducing your toddler to a range of music. Watch the way they respond to classic music versus a pop song. See if they seem to prefer a particular musical over all others. Share with them songs from when you were a kid and let them witness your own joy in singing along. In the car, at the dinner table, while doing chores; all opportunities to expose your child to another musical experience. As you can see, there are hundreds of ways in which you can begin to enjoy music with your toddler. How many more toddler music experiences can you think of? Nervous about starting music lessons for your kids? Fear that they may require your mini maestro to know his or her Do, Re, Mi from their Fa, Sol, La, Ti? Our group music lessons for kids are designed specifically to bring out the joy of music. We take play-based learning to the next level! In addition to focusing on joy, there are also many opportunities in our music lessons for kids to gain musical knowledge. We believe that when kids are playing, kids are learning. In our mixed age group sessions, we provide a relaxed and informal setting to ensure that parents and kids all feel as comfortable as possible. Our venue for the group music lessons for kids is the Karingal Place Neighbourhood Centre-with a park next door and café across the road it is perfectly placed to enjoy a morning with your little one. The room is set up before arrival with cushions on the floor; when you arrive, simply take a seat and wait for the magic to begin!  Join in on the songs (or not! individual in the room. This means that if your child wishes to hold 7 shaker eggs instead of 2, their choice will be embraced and celebrated. Why do we choose to deliver relaxed music lessons for kids? We believe that play based learning offers challenges that will extend a child’s problems solving skills in a supportive environment that respects the whole child. We invite the child to play, however the greatest learning takes place when participation is freely chosen. Focusing on the process allows our music lessons to unfold in a way that responds to the needs of each individual child in the class. If your child wishes to beat a drum enthusiastically than our teacher will skilfully respond to that movement with a song about thunder before gently softening her voice to encourage a change in tempo. The learning takes place so naturally that sometimes it is only upon reflection that the adults in the room realise what has occurred! Will music lessons suit my kids of different ages? Our mixed aged group lessons are a wonderful way for siblings to enjoy an activity together. It can be a challenge to find something suitable for a toddler and a pre-schooler however because our classes use play, varying skill levels and attention spans are all catered to. A note on siblings: A reluctant participant can often be encouraged to join in when they have a sibling in the room- especially one who is younger and perhaps still in the pre-verbal stage. The older child may be tight lipped when prompted to sing their name as part of a song however they will announce their sibling’s name on their behalf loudly and proudly seconds later! Using this role of big brother or big sister can be a wonderful way to foster all that emerging confidence. We offer a free trial lesson so please feel free to come and try out our music classes at a time that suits you. We hope to see you and your little one soon! Did you know that tracking moving bubbles is fantastic for children to strengthen their eye muscles, making depth perception more accurate. Children are born sighted, but with poor vision as these muscles, like all of our muscles, need to work to gain strength. The benefits continue when children are old enough and strong enough to stand, as catching bubbles is great for weight transference from one foot to the other as they reach to pop them. Something as simple as playing with bubbles can have big benefits. Social Connectedness: Without the Pressure!  Social development when the child discovers the consequences of resisting said sharing and turn taking! For many parents, the idea of enjoying a cup of tea and venting about sleepless nights while their children work out how best to steal another’s toy can be the highlight of the week. But for others? Baloo Baleerie is one of my favourite Scottish lullabies. In our children’s classes we use songs from all over the world, but try to select most of our repertoire from the ethnic backgrounds of the children present, so that they have strong cultural links to their past. Like so many Australians I have convict heritage, specifically from Scotland. I imagine my great great great grandparents may have been sung this beautiful lullaby as children. Here it is (sped up a little to fit the whole thing into the video) so feel free to learn it, then take it nice and easy at home. Who’s in Charge? Using Music Classes to Teach Body Autonomy in Children. Here at Sounds Like This for Kids, we’ve developed a philosophy which guides every interaction we have with the children engaging in our music classes. There are many facets which shape the way our classes unfold however a fundamental element is our belief that the way the participants move and use their bodies throughout the session is their own choice. The only caveat to this policy is safety to themselves and to others. By the same token, there is just as many practices that you, by design, will not find in our classes. Delivering our classes with this philosophy in mind means that each child is benefiting from years of research into child development, brain development and child psychology. To break down the outcomes and to ensure that we are walking the walk and not just talking the talk, we like to focus on a few different areas. Providing children with the opportunity to solve (seemingly) simple problems not only enhances their self-esteem and confidence when it comes to facing challenges, research shows that it also encourages creative thinking. What’s not to love? The role of the teacher and parent is to offer the time and opportunity for children to explore, experiment and use trial and error in their experiences as their maturation and interest calls for it. The way that this translates in our sessions could be as simple as discovering how best to strike a drum for maximum impact! The process is an organic element in the participant’s overall learning. Mixed messages around body autonomy is a real issue that parents face during day to day interactions. While we teach children about body safety, we also encourage them to hug a relative or sit on Santa’s knees. The parent’s urge to be polite is often in conflict with the child’s need for personal space. At Sounds Like This for Kids we remove the expectation for children to sit on laps or interact physically with anyone else in the room. Taking the pressure off allows them to relax and get the most out of their class in an environment where parents can also feel confident in a non- judgemental space. Discovering something new, mastering an emerging skill or the thrill of surprise when a teacher responds to a beat set by the child is perhaps the most important component in our philosophy. It is our ‘why’ when it comes to creating a relaxed, creative and supportive space for children and adults alike. We believe that happy and relaxed participants make the most receptive students! Our objective is to not only teach music making skills, we hope to instil a love if the process itself. Now, this all may sound pretty heavy for family music classes but when you consider the simple ways in which this philosophy translates into practice you’ll probably find similar situations popping up for your family in day to day life. As always, we are happy to answer any questions or queries related to this or any other component of our service so feel free to get in touch and start your musical journey with Sounds Like This. Did you know it takes just one generation of not being sung to for people to think that they can’t sing? One generation. Take a moment and think of how many lullabies you know. Ten? Five? One? A breakdown in community connectedness. As our lives get busier, there is less opportunity to gather for music making both as a community and within our own families. When it comes to learning to make music, the goal is to embrace your tuneful, beat-ful and artful self! In order to encourage the development of these three components, we can provide our children with support in the following ways. Are we singing in a pitch that children can reproduce for themselves accurately? Are we singing songs that are vocally appropriate for the age and physical development of their voices? Are they immersed in the whole tonal language of music? In my sessions I sing in a rainbow of tonal colours. From ancient modes, to modern major and minors, pentatonic, whole tone, chromatic scales, to name a few. Introduce your child to film scores and classical music next time you are in the car. They’ll be transported by them. They’re magical! Does your child hear polyphony? Rich harmonies on various instruments and with voices? Are you sharing songs from your parent’s and grandparent’s past that can help to build intergenerational bonds? Are these songs that your children will one day sing to their own babes? This is one you probably already do without thinking. Bouncing them on your knee, tapping on the ground so that they can feel the vibrations and dancing around your kitchen to music with strong beat from your culture and others. All this is helping your kids to be beat-ful! Have you danced with your baby to the blues, to funk, to Latin, to jazz, to an Irish jig? All of these styles feel different and encourage varied movement as we immerse ourselves in the beat. We’ve saved the best for last. This is arguably the most important element. Are we encouraging the art? Is the text stale and monotone or lacking emphasis? We don’t want to sound like zombie drones. We want to be fresh and inspired! Rhymes and songs should be scrumptious, delicious and like your life would be incomplete without them. That’s the “art” part, and that is what is so often missing when enjoying musical experiences in modern life. Is the text in the rhyme or song funny, sad, tender, playful, charming or gross? Are the children getting that from the delivery? Imagine; you could you be a story-teller not just through books, but through music! The gift of music is something your child will share with you for a lifetime. Why not start sharing in the joy right now? Just remember: tune, beat and art. Give it a go! What is the best music for a child's growing brain? That may seem like an easy question, but the answer is actually quite complicated. In short, lots of DIFFERENT music is the best music for your child. I would argue that active musical listening is as important to the brain during a child's early years as language is. It works just like language during the brain's development. We know that exposing your child's ear to as many words as possible in your native tongue/s, during their first years changes the way their brains process language. Without these linguistic interactions early on the brain does not grow the synaptic connections that it will use for the rest of it's life. The more these connections are used the stronger they become. If they're not used they atrophy and you can not establish them later on. The brain must take different pathways (pathways created for another purpose) to complete the desired task. Developing the synapses for music is exactly the same as language. You want lots of strong pathways established early on, so they will have them for their lifetime. Exposing a child to music is good. Exposing a child to an enormous variety of music from their culture, from around the world, in a host of time signatures, musical keys and tonalities, with varying feel, instrumentation, dynamics, layers and voices is better. MUCH better. It is with this in mind that we select the music for our sessions, but more on that later, this post is about you and your child beyond our class! What type of music do you hear most often? What do you hear when you put on the radio in your car? What is your child listening to? What instruments? How many of the sounds that you're hearing actually are instruments and how many of them are electronically generated sounds? Are the voices natural sounding or have they been tampered with too? Let's make a conscious effort to expose children to new sounds! Not sure where to start? We live in a world where accessibility to recorded music is easier than ever before. Spotify, YouTube, iTunes and Google Music are available at our fingertips, not to mention any physical collection you may own. I'm still hanging on to my CDs and actively growing my vinyl collection (thank you op shops). Does anyone still have a tape deck? Am I showing my age? Seek out other genres that you would not normally listen to. Classical (baroque, romantic, classical, impressionist, twentieth century), blues, funk, metal, folk, rock, jazz, country, soul, reggae, pop, electronica, dance, and I'm sure a million sub-genres within all of these. Once your child is no longer a baby they can play an important role in directing their own musical listening and appreciation. Ask them what they like. Ask them what they can hear within the music. Help them identify new instruments! Turn off the 'kids' music. Most commercially available music that is targeted at children is rubbish (I have strong feelings about this) and could actually be very harmful to their developing vocal chords, if they sing along, often and loudly. This music is usually pitched in a range that is comfortable for an adult voice, often an adult male voice, which its physically much larger than a child's. If your little one sings along loudly and often they could be at risk of doing serious long term damage to their vocal chords. I'll come back to more on this in the weeks to come with another top tip. We want kids to sing, but we don't want them to hurt themselves! Play real music to your kids. Start here... Hendrix, The Beetles, Mozart (who incidentally sold the most CDs of any artist in 2016, WOO, go Wolfgang! ), Stevie Wonder, Bela Felck, Matt Corby, Van Halen, Debussy, Ravel, The Eagles, Bill Evans (jazz pianist), Nat King Cole, ELO, David Bowie, Queen, Daft Punk, Bob Marley, Vulfpeck, Aretha Franklin, Johnny Cash, Marvin Gaye, I could go on forever, oh how I LOVE music! Happy listening, dancing, moving and grovin', music lovers! I've always been interested in exploring the sounds something can make, I thought I was all over it, I played instruments, went to concerts, heck I was studying 'proper' *clears throat* classical music at a private conservatorium. Then I moved in with a drummer. Well, he could make sounds and new sounds in ways I had never heard before! He thought differently about sound production. It was not a means to an ends for him, it was something magical to be treasured. Doing the dishes was a complex exercise in exactly which bowls filled with how much water could create the pitch and resonance he was after. It took forever to get a clean cup, but it sounded amazing. This drummer played like a child. There were things to bang, crash and bop! He was delighted in his exploring and in absolutely no hurry to speed up his exploration in the name of getting the job done. As he saw it, making music with the pots and pans was far more important than having clean dishes. You know what? He was right! Living with him taught me to slow down. Watching him take household items and transforming them into musical instruments was and still is amazing. Years on, we share our home with our two young children. Our boys are often loud. They love to bang, crash and bop, just like their dad. Unless someone is sleeping, we usually let them. Why? Surely living in a quieter household would be better for my nerves?! We don't stop them because they are learning. They're learning about physics, vibration, resonate properties of different materials. They're learning about cause and effect. They're learning that when they hit something hard is sounds louder, they're learning that when they are gentle it sounds softer. They are building their muscles and developing more control and intent in their dynamic (volume) contrasts. They're learning that when they put their hand on that pot that they just wacked with a wooden spoon, that they stop it from vibrating and therefore stop the sound. They're learning about how sound is created and moves and stops, and that THEY are in charge of that. They're learning about using their voices. Our first son spent the best part of a year calling "hello" in undercover car-parks. He was listening for the echo. He waited to hear how many he could get back. He changed volume and the length of the "hello" to change the response. He figured it out for himself and every time he did his face lit up with an "AH HA!" moment. You want these moments. You want your child interested. Interested children are involved and excited about their own learning and these children learn A LOT! You want to let her explore sound and to do it on her own terms. When we talk about play based learning, this is what we mean. It means don't interrupt. It means, as the grown up you are not in charge, however well intended you may be, a child will learn FAR more by figuring things out for themselves in a child-lead way. There's no right way to hit a pot with a spoon, there are many ways and they will result in different sounds, but one way is not right and another wrong, just different. So, I urge you to not be too hasty in cleaning up the mess of plastic containers, pots, pans, spoons and lids, that your little one has spread all over the kitchen floor, yet again. To let them make child-led choices about how they interact with the world around them. Musical things are usually inanimate objects, rather than something flashy a marketing department of a corporation is targeting at your children (a rant for another time). The real musical 'thing', is the person who thinks in sounds and creates music with things, anything. Let your little one be little and have the freedom, time and space to be that musical 'thing'! If we want children to grow to be musical beings they need to hear live music. No amount of pre-recorded music, aimed at children is going to cut it. Most music played for children shouldn't be children's music at all, but that's a rant for another time! What we need for children to become musical is music created right there and then in front of them. It needs to be organic and enticing. Music with real instruments. Music with real musicians. Hopefully REALLY good musicians! It doesn't really matter what style of music it is, just as long as it is delivered with passion from people who care about it. My kid's favourite type of music is symphonic film scores or wailing electric guitar, Hendrix goes down a treat around here! I'm talking about experiencing the blues live, or folk, or classical, or some sort of weird and wonderful prog-fusion. I'm talking about taking your family for an adventure down the peninsula during the summer to one of the many markets (perhaps Emu Plains at Balnarring) or wineries who have live musos (Hickinbotham in Dromana springs to mind), and letting your children get up close to the instruments. Let the kids dance and move however they want to. Let them figure out where the sound comes from. Let them charm the friendly musicians into giving them have a tiny strum and a hit on a cymbal. Experiences like these can be life changing for young children. I remember so clearly, being eight years old and having a string quartet come to my primary school. Following their amazing concert (it was seriously amazing, I thought they were magical!) they let the kids get up close to see how the strings vibrate. They showed us how they sound different when bowed and plucked. They showed us how to make it loud and soft. From that moment on I felt differently about "classical" music. It was instantly less stuffy. It was accessible, but you had to worked for it. I remember appreciating how clever these musicians were, but that they were also just people. I remember thinking that was just a person and wanted to do clever things with instruments too! So, head into the city and claim your spot of the grass at the Music Bowl and be completely enchanted by an entire symphony orchestra one balmy evening. Find some buskers in a hidden skyscraper shadowed lane-way. Venture to the Melbourne Zoo for their chilled 'Zoo Twilights". Find a rural Christmas Carols event to sing along at. Melbourne has the "Music Play Children's Festival" on from the 14th through to the 17th of January and there are hands on events at the Recital Centre including "Sensory Sounds". I know taking children to formal concerts could potentially be an absolute nightmare experience, but in the summer time there are countless outdoor and family friendly events on offer on the Peninsula and in Melbourne, so it's a fabulous time to get your music on! Get out there, make some memories and have a ball!